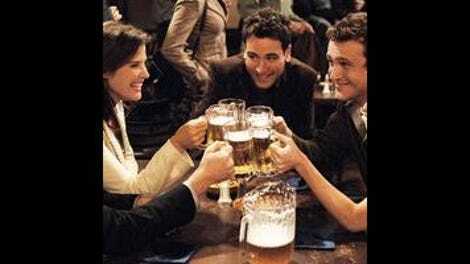 Allow me to express a heretical opinion: Ted is still the linchpin of How I Met Your Mother. It’s not just that the show’s overall arc has to follow him. It’s that if he falls too far away from the action, the show’s problems tend to assert themselves over its strengths. The other characters are conceived more broadly because no matter how detailed their stories become, they function within the show as illustrations of the various fates of youth. Ted is the one who has to integrate all those lessons into one life, and that makes him an indispensable anchor. None of that means he couldn’t still be a complete failure as a comedy character, though. And I know many people who feel that he is, either due to the way he’s written or the way Josh Radnor plays him. But I couldn’t disagree more. Ted’s not just an inevitable consistent point of view. He’s not a cartoon, but he’s also not a beacon of boring sanity. Ted has flair. And sometimes, when nothing else is going right in the HIMYM universe, Ted can be its saving grace. That’s the way I feel tonight, as Barney and the Ericksons take center stage in the battle for the nannies. One character’s conflict is wacky and unrealistic; one’s is cliche and predictable. Put them together, and you’ve got an unpromising brew of sitcom business as usual. After breaking up with Quinn, Barney proclaims Bangtoberfest (“I spent $7,000 on merch; this is happening”) in an effort to shake off the last vestiges of monogamy. Meanwhile, Marshall and Lily are finding it hard to find nannies in their price range to take over Marvin’s care when Lily goes back to work. When Lily happens to mention the website heynannynanny.com while bemoaning their lack of success, Barney seizes on the ready supply of young women by posing as a billionaire single dad looking for a caretaker for a boy whose mother died from having too many orgasms in a row. (Ew.) The two conflicts collide when Barney poaches the one affordable and reliable nanny the Ericksons find, someone whom Marshall trusts for her St. Cloud connections (she’s a Jorgenson as in George Jorgenson’s Organs, known since son Morgen joined the business as George and Morgen Jorgenson’s Organs). All this has its moments (and the Jorgenson dialogue is definitely one of them). Marshall’s kid-at-Christmas excitement over a double-loop racecar track bought by Barney as an invisible kid accessory serves as the highlight; he raids Barney’s smoke detectors to cobble together six nine-volt batteries to power it, and when Lily has trouble relinquishing Marvin to the perfect British nanny Barney hires for them, Marshall never takes his eye off the track while mumbling: “Someone who’s not in the middle of a race should probably go talk to her.” But the two storylines never commit to any real emotional stakes. Lily discovers quite belatedly (end of act two) that she has mixed feelings about going back to work. Barney gets beat up by all the nannies he scammed and makes a weak vow not to run elaborate hits on young women in bars. I actually love where the episode ended, with Lily’s dad Mickey revealing that he was a really good dad before the age where Lily starts remembering what a crappy dad he was (flashback to Mickey at the track looking for lucky numbers: “What’s your birthday?” Despondent pigtailed Lily: “Today”). But Mickey hardly appears in the episode until that moment, showing up at the start to establish that he’s homeless again thanks to that batch of Chinese fireworks that were going to serve as endless Christmas gifts, and making no serious bid to convince Lily he’s the solution to her problem besides subliminal passing comments. No, for something that feels fresh and vibrant, you need the very slender B-story of “Nannies,” where Ted and Robin compete to establish whose soon-to-end relationship is more deeply committed. Ted takes an early lead with “Victoria keeps tampons in my apartment,” but Robin counters with Nick’s parents inviting her to spend New Year’s Eve in Hawaii. When Ted tries to claim that the only reason he hasn’t met Victoria’s parents is because they’re dead, Robin’s “Are they, Ted?” elicits a “No” that’s simultaneously bluff and cave. Having just recently watched “Slap Bet” for the TV Roundtable, I was struck by how much that little moment reminded me of Ted’s lawyering collapse from that episode—only a fleeting instant of comedy, but the one that makes everything that surrounds it more than just clever writing. It’s cleverness anchored by characterization, and delivered with consistency and panache. Before long, Ted and Robin suss out each other’s relationship weaknesses, and have to cop to their own. Nick not only cries over the Giants’ poor play-calling, but he also demands space to be irrationally emotional (“Robin, I don’t need you to fix this, I need to be heard!”). Victoria is a super-slob that drives Ted’s neat-freak side crazy. The two friends put on a brave front for each other (“Victoria’s messiness just forces me to grow as a cleaner!” “Without Nick, who would hem my pants?”), but the only relationship that’s going to survive, we know, is theirs. And I wouldn’t want it any other way. Ted may not be the dominant flavor of HIMYM these days, but he’s the straw that stirs the drink. Actually, put Robin in there, too. This started with them, and even though we’ve known from the first moment that they won’t end up together, the show will certainly be over when they’ve exchanged drinking beers with each other for drinking beers with their spouses. Until then, they will remain at the heart of the show at its best, and their absence or misuse will haunt the show at its worst. Unfortunate bit of misdirection during the flashback showing how Mickey took Marvin from a sleeping Lily: Mickey enters the apartment with what I assumed to be a sandwich (or in the parlance of this show, a “sandwich”), which then becomes super-confusing when he swaps it for the baby in Lily’s arms and then later gets hungry and performs a second swap for a monkey. Turns out it was a burrito. A show with this much sandwich-related continuity might want to watch it with the foil-wrapped lettuce-littering vaguely-submarine-shaped foodstuffs. Hey, people who haven’t had babies yet? Poop isn’t that bad 99 percent of the time. Really, I know I’m contradicting decades of pop culture, but it’s time you knew. Barney’s very broad in this episode, but there’s always still enjoyment to be had watching Neil Patrick Harris perform him with unreconstructed gusto. And I quite liked “Almighty five! Ow!” after the Bro Upstairs blesses him with heynannynanny.com. Which is a real website, of course, and if you didn’t click on the link above, let me spoil it for you: It’s a wanted poster warning nannies not to be fooled by Barney or any of his aliases, a few of which link to previous real websites. George and Morgen Jorgenson opened up a new organ store in Oregon. It’s called Piano Town.